Community is central to ALFA. The proverb "It takes a village to raise a child" is a guiding principle at ALFA with parents, teachers, tutors, and the greater community working in partnership to shape future generations. 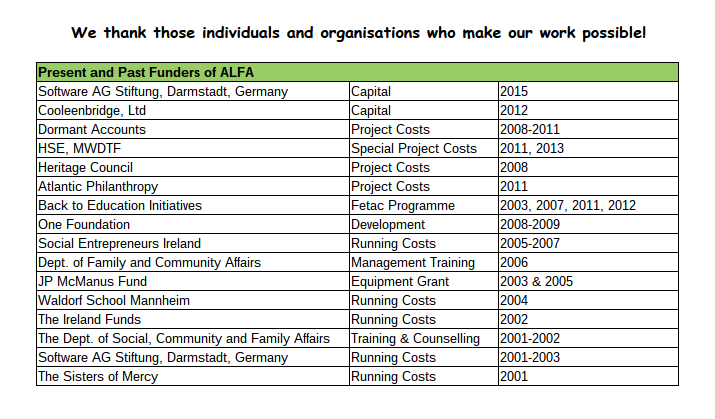 ALFA thrives thanks to the support of community partners in East Clare and beyond. With special thanks to those individuals and organisations who make our work possible! Limerick Institute of Technology and ALFA formed our first formal partnership in 2008 promoting the development of ALFA's and LIT's 'active learning' programmes. This partnership continues through to the present day with LIT's Vice President delivering the Class of 2015's graduation address and with the ALFA students of 2015/2016 attending a special five week math course hosted by LIT at ALFA. A very successful local youth club and cultural exchange group for teenagers aged 15yrs and up, where the young people themselves, with the guidance and support of the group leaders, have an active role in the management, running and decision making process of the group. An initiative to support people with special needs living in community. The Woodland League is a key partner in protecting and restoring the woodlands that surround ALFA and beyond. Future plans for ALFA students to assist in the Woodland League's mission to restore the Great Forest of Aughty are in the works.